Nokia Tube is here ,guys, and now it’s called the 5800 XpressMusic… clever marketing on Nokia’s part because they don’t want to draw direct comparisons to the iPhone and the XpressMusic line is quite popular in the low end, at least in the U.S. It’s music-centric device, says Nokia, and has a 3.2-inch haptic touch-screen, 3.2-megapixel AF camera with dual-LED flash, VGA front camera, A-GPS, HDSPA, up to 16GB of storage via microSD and some loud speakers which were actually quite clear and crisp. We saw the Tube last night and neither of us came away impressed. I thought the accelerometer was quite responsive, but we were sorely disappointed in the Web browser. The menu system was overcrowded and wasn’t simple like the iPhone’s. S60 devices are just a big mess of menus and sub-menus and this was no different. The 5800 will be available in Europe by year’s end for 279 Euro/129 UK Pounds/$227 USD and it comes with a fancy plectrum-style stylus and an 8GB microSD. There are no carriers announced and it may be available from Nokia stores and online next year. 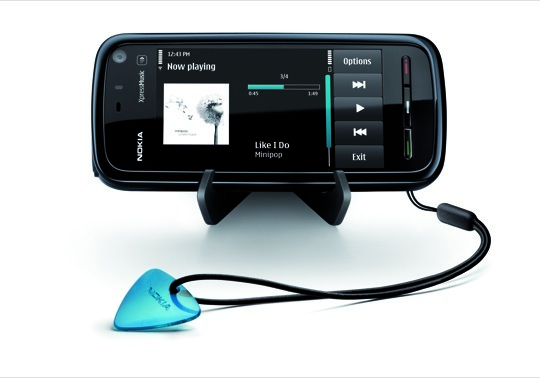 This is also Nokia’s Music phone, a service that offers unlimited music downloads for the first year of ownership.